NEW YORK – July 11, 2017 – Combate Americas and Relevent Sports, a division of RSE Ventures, today announced five new marquee bouts to its upcoming “Combate Clásico” professional Mixed Martial Arts (MMA) event in Miami, Fla., on Thursday, July 27. Making his return to the Combate Americas cage La Jaula is top-ranked bantamweight (135 pounds) star Ricky “El Gallero” Palacios (8-1), who will move up to the featherweight (145 pounds) division for the second time in his Combate Americas career to face his toughest test to date – two-time Ultimate Fighting Championship (UFC) veteran and Nate Diaz protégé, Chris Avila (5-4) of Stockton, Calif.
“This is shaping up to be our most stellar fight card, from top to bottom, to date. With the matchup between Ricky Palacios and Chris Avila, we are destined for another memorable night of electrifying action in La Jaula,” Combate Americas CEO Campbell McLaren said. 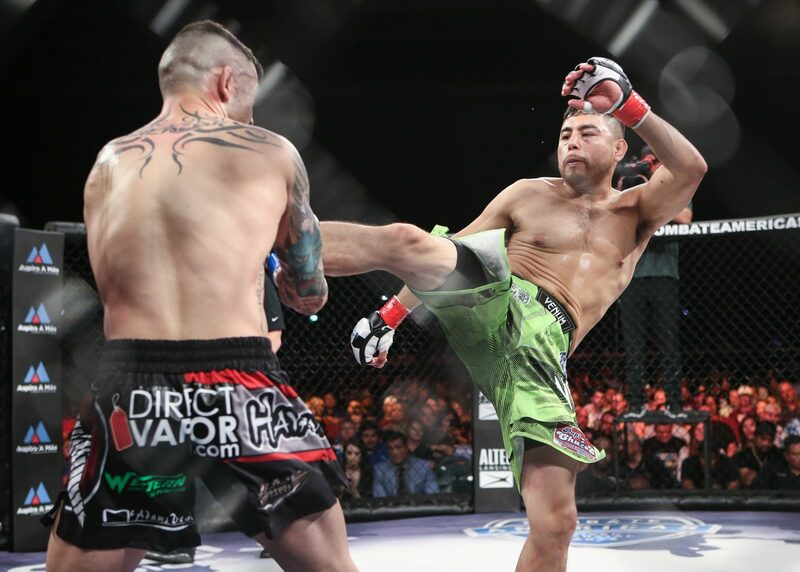 Fresh off his triumphant victory over another former UFC star Roman “El Gallito” Salazar at Combate 13 on April 20, the hard-hitting 30-year-old Palacios of Mission, Texas, also an unbeaten professional boxer, looks to extend his five-fight winning streak. The 24-year-old Avila of the famed Cesar Gracie Fight Team makes his debut in La Jaula following a pair of hard-fought decisions under the UFC. In bantamweight action, the red-hot Marcelo “Pitbull” Rojo (11-4) aims for his fourth consecutive win and second straight inside La Jaula following his blistering, technical knockout win over Ivan Hernandez “Brasil” Flores at Combate 12 last March in Tijuana, Mexico. The 29-year-old Argentinian will be paired off against Puerto Rican sensation Billy Molina (5-3), 30, making his Combate Americas debut after last month’s return to action in Bayamon. Joining the featherweight (145 pounds) division for “Combate Clásico” is undefeated Venezuelan finisher Alberto Montes (3-0). Fighting out of the MMA Masters gym in Miami, the 23-year-old prospect locks horns with 30-year-old Combate Americas veteran Jonathan Quiroz (2-2) of Long Beach, Calif.
Grizzled veteran Irvin “The Beast” Rivera (5-3), best known for his thrilling, back-and-forth wars with Jose “Ghost” Ceja, looks to get back to his winning ways at the expense of prolific bantamweight wrestler Chino Duran (8-9), who makes his return to Combate Americas after a torrid run on the Florida MMA circuit. Rounding out the newest additions to “Combate Clásico” is 24-year-old Joey “El Cazador” Ruquet (4-1), coming off consecutive wins in La Jaula and ready to make a run at the top of the bantamweight division by tangling with Florida’s own Vinney “The Instigator” Pantaleon (1-1). Tickets for “Combate Clásico” are on sale online at Ticketon.com. Additional bouts will be announced in the coming days. The “Combate Clásico” live MMA event will join a nearly week-long extravaganza that begins with a match between marquee soccer clubs Juventus and Paris Saint-Germain at Hard Rock Stadium on July 26 as well as concerts, parties and other interactive events prior to El Clásico Miami on July 29.